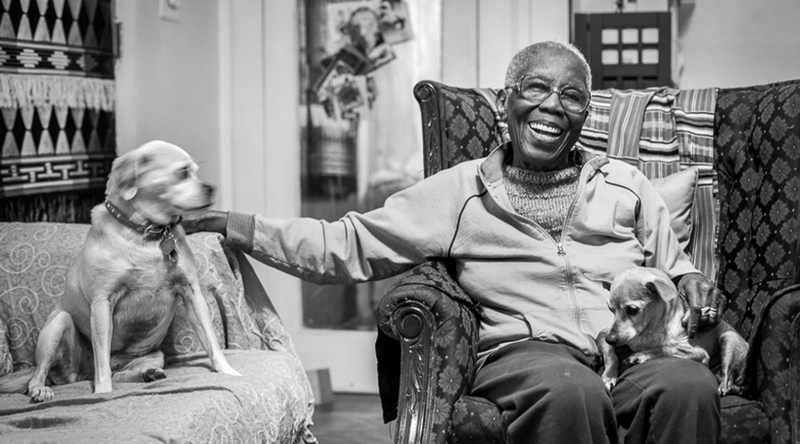 Gladys Barker Grauer in her home and in her element. Photo by Colleen Gutwein, 2014. Gladys Barker Grauer was born in Cincinnati, Ohio, in 1923, and grew up on Chicago’s South Side. She attended the Art Institute of Chicago before moving to New York City, where she worked as a freelance artist, became involved in civil rights and political movements, and met and married Solomon Grauer. In 1951, they moved to Newark, NJ, to raise a family and continue their community and political involvement. 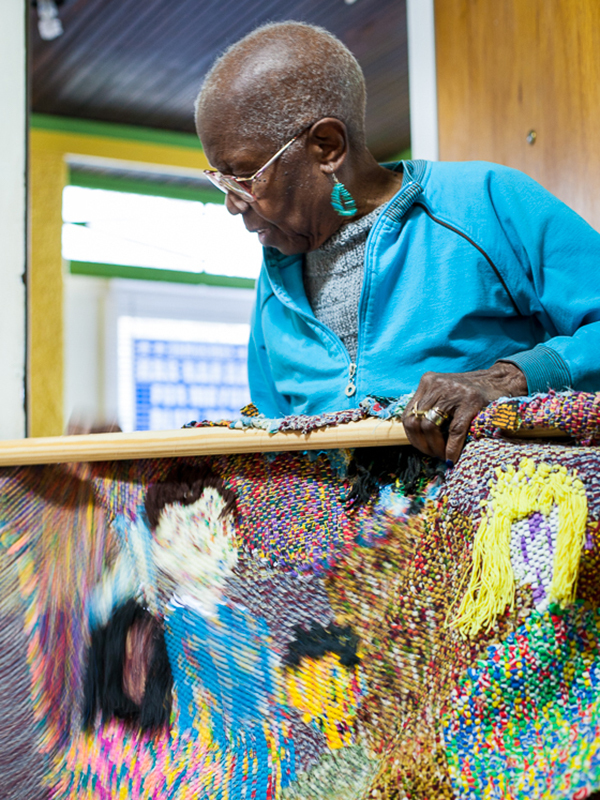 Gladys Barker Grauer sharing details about her textile art. Photo credit: Colleen Gutwein, 2014. Her sociopolitical influence and support led her to run for the U.S. Senate as the Socialist Worker’s Party’s nominee in 1960, when women were still a rarity as the face of a political party. In 1972, Grauer fulfilled a long-time dream and opened the Aard Studio Gallery in Newark’s South Ward. Through her community-based art gallery, Grauer helped launch the careers and critical evaluation of numerous black and brown artists. Her gallery addressed the needs of artists of color by providing a forum for mutual support, professional networking, exhibition and selling of their art, and helped set the stage for the larger appreciation of the creativity of artists of color. When looking at my work, what the viewer sees and feels is important, not what the viewer thinks I am saying. Over the past 70 years, Grauer’s artwork has been exhibited locally, nationally and internationally — from the Newark Museum to Dakar, Senegal. Since 2006, she has completed four murals in Newark metropolitan area, including one at Arts High School and along Hawthorne Avenue in a tribute to Newark jazz clubs. She continues to inspire the next generation of artists and to creatively express through visual discord, her social, political and personal views. Her work is a part of many private collections, as well as in the permanent collections at the Newark Museum, Montclair Museum, Zimmerli Art Museum, Newark Public Library, Morris Museum, Noyes Museum, National Art Library of the Victoria and Albert Museum, The Library of the National Museum of American Art, New Jersey State Museum, Morgan State University, and Johnson & Johnson. Gallery Aferro is proud to work with Gladys Barker Grauer to help facilitate all research, purchases and exhibition services for Grauer’s art catalog. For art collectors, curators, scholars, educators, students and enthusiasts, you can now inquire with the gallery staff about Grauer’s body of artworks, as well as access catalogued images and information about her extensive collection of paintings, prints, textiles, and sculptures we now steward. More than five decades of artwork are held at the gallery, ranging from striking early prints dating from her radicalization in Chicago ca. 1940s to recent double-sided textile masterworks made in 2017. All images provided by Colleen Gutwein. Gutwein is a digital and analog photographer from the Northeast United States. She works predominantly in documentary and portraiture styles. Her days are currently filled working on The Newark Artists Photo Documentary Project. This multi-year endeavor documents established and emerging visual artists in the City of Newark, creating an archive of their contribution to the dynamic arts and cultural scene that has defined Newark’s artistic community for the past century.